Like many others, I too retired a few years ago, after almost 30 years working as a teacher, superintendent/warden, and assistant deputy director for the California Youth Authority. My husband of 33 years and I spend 6 months a year in Northern California, in the foothills of the Sierras, and the other six months on Flathead Lake in western Montana. 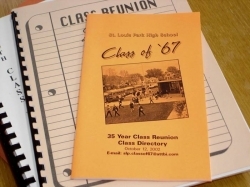 My husband graduated from SunnyHills High School in Fullerton, CA in 1967, and he believes that one of his classmates married someone from our SLP class of '67. If this sounds familiar to anyone, we would love to hear from you! I am looking forward to attending the reunion and thank the organizers for their efforts. I have been happily married to my wife of 44 years, Carter, of Washington, Virginia. We live in Fairfax Station, Virginia and are blessed to have three children and two grandchildren. After graduating from the Naval Academy, I completed a full Navy career over 29 years, having commanded two nuclear submarines and retiring as a Navy Captain. We lived in South Carolina, New York, Connecticut, Virginia, Maine and Washington State during that period. Running still remains a pastime, having completed five Marine Corps Marathons and numerous 10K races. I am currently serving in a senior executive service position in the Office of Nuclear Energy of the Department of Energy. From Ruth: I have been working at Methodist Hospital for the last 35 years and spent most of my life caring for my parents. They were able to stay in their SLP home for 60yrs with much assistance from me, and I was happy to do it. I haven't ventured far from SLP, but did move to Hopkins. Hoping to retire soon and move down to Johnson City TN where I have friends. From Susan: I have lived in Georgia for 44 years. Stephen and I have been married for 41 years and have three children 39, 33, 32, and six grandchilren. I have been retired from teaching 2nd grade for 7 years. We are loving retirement!! From Ron: After attending the University of Minnesota, for the past 40+ years I have been working in the Aerospace industry. I met my wife Gina in Seattle, we have been married 43 years and have 2 sons Jeff and Daniel. My career has taken us to San Diego, where we call home - although during this time my company temporarily relocated us to France, Singapore and China. We've enjoyed many wonderful experiences and interesting people that has provided a very fulfilling lifetime of happiness. In 2014 I was diagnosed with cancer which had been eating my heart and lung - followed by chemo and heart / lung surgery, and then radiation. After a miraculous recovery decided in July 2016 to finally retire. Now both my wife and I are continuing to enjoy this new season of our lives with awesome friends, family and more exciting experiences. From Barbara: For the past 37 yrs I've been living in a cabin out in the woods in northern Minnesota. It is really very nice, we are on beautiful lake and our friends (guest) actually pay to come and stay with us. I have a reasonably great husband most of the time, two terrific kids some of the time and 13 very interesting active and fun grandkids all of the time. Our daughter, Gina the good one, lives 4 miles away with there 4 boys. She homes schools them and they help us alot around the resort. They keep very busy with sports, hunting and fishing. as well as a company that provides paramedic support for forest firefighters (firelinemedics.com). For excitement last summer we did a recreation of a motorcycle trip we took 41 yrs ago to the Artic Circle, North of Fairbands, Alaska, then down to Sturgis,South Dakota. Quite the adventure, not many of those left in our aching bodies. Looking forward to seeing everyone and renewing old friendships.